ON SALE Furniture grade, (UV protected) 1.5" 4 ways, "pvc side outlet T's." Slip all four ways. Used for many construction projects. Beveled Outside Edges. 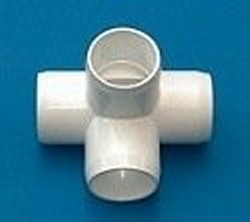 NOT a NSF rated fitting, cannot be used on projects that require plumbing inspections, but it will not flow water without modifications. (Some mold flashing may be present. Most of the time they can be cleaned up easily.) .